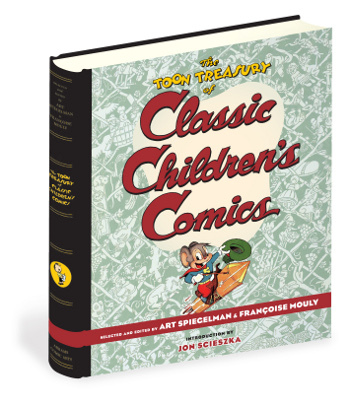 Françoise Mouly and Art Spiegelman, the smart duo that brought us Toon Books last year (a RAW Junior imprint of hardcover comics for emerging readers), now bring us The Toon Treasury of Classic Children’s Comics (Abrams, September 2009), and it’s pure joy is what it is. And, for further validation, it includes a word from The Cool One himself, Jon Scieszka: “So now you don’t have to moan about your mom throwing away your best comics anymore, because Uncle Art Spiegelman and Aunt Françoise Mouly have brought you a present,” he writes in the book’s introduction. At last it’s possible to test our idea that some of the best twentieth-century literature for kids appeared in lowly comic books that deserve an honored place next to the more traditional classics on every well-read child’s bookshelf…The adult world saw comics as junk culture—toxic, or at best, harmless. But today, in hipster clothing and Clark Kent glasses, the once disreputable comic book confidently strides into bookstores, museums, and universities cleverly disguised as the upwardly mobile “graphic novel.” Librarians—no longer fearful that comics will blunt children’s ability to appreciate more traditional kid books—are today among the greatest champions of the form, as they see young readers skip past the computer terminals to curl up with objects that look a lot like books. They divide the collection up into five main chapters (“Hey, Kids!”; “Funny Animals”; “Fantasyland”; “Storytime”; and “Weird and Wacky”) and acknowledge in the opening that, in all their studies and sifting and reading, they found themselves returning to the same “great storytelling artists,” deciding to give over the book primarily to “four giants”: Carl Barks, Walt Kelly, Sheldon Mayer, and John Stanley. But Mouly and Spiegelman have made sure to include those lesser-known artists as well: The book is a treasure trove of comic book gems, and the aforementioned opening chapter from the two—“Out of the Trash and into a Treasury: A Word (and Some Pictures) for Grown-Ups”—is worth reading alone. Though they say that their book is “hardly…directed at historians, cartoonists, adult-comics fans, or scholars of the form” and that their goal was to find comics appreciated by children of all ages, it’s obvious they’ve done their homework and have crafted a smart, thought-provoking opening chapter to the book that, indeed, will leave those adult fans quite happy. As well as, of course…well, the entire rest of the book, all devoted to comics. Did I mention 350 pages of them? I’ve got a bit more art from the book. Enjoy. “Hey Look! Optical Illusions” from Hedy De Vine Comics no. 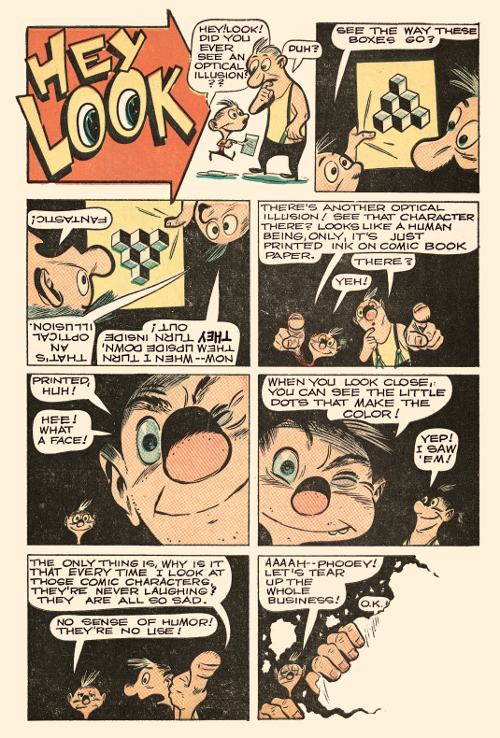 25 (February 1948), used by permission of the Harvey Kurtzman estate. “Gone Fishing” from Animal Comics no. 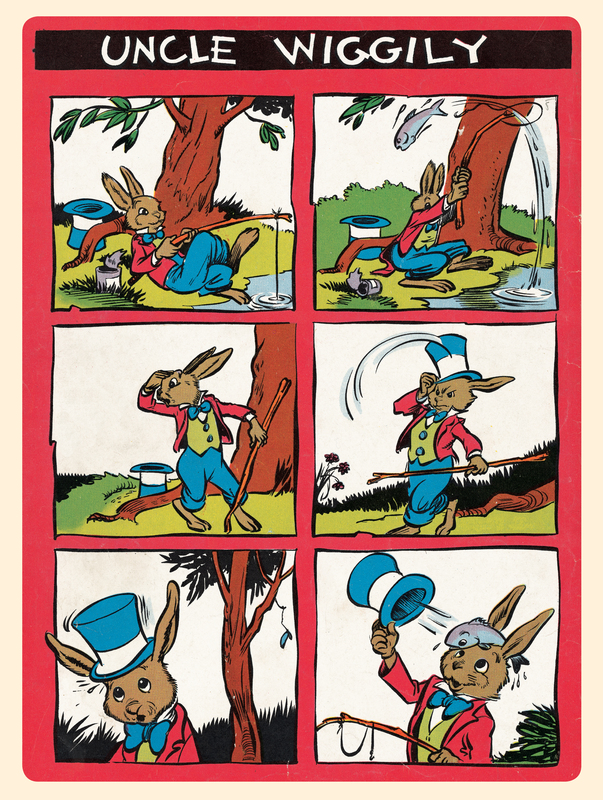 19 (February–March 1946), copyright © Okefenokee Glee & Perloo, Inc., used by permission of the Walt Kelly estate. “Crossing the Street” from The Spirit, July 17, 1949, used by permission of Jules Feiffer. This is SO going on my Christmas wishlist…! I wonder if librarians EVER used to suspect that comics might actually be useful, despite their fears to the contrary. In other words, were their fears more of the “Oh, I could never say THAT in public!” sort of fears — back in the days when legislative and regulatory bodies were establishing codes of conduct for “good” comics? I’m pretty sure I taught myself how to read by snatching comics from my brother’s collection (and by watching Sesame Street). Ooh! Uncle Wiggly :)! Looks like a fun treasury, great keepsake. 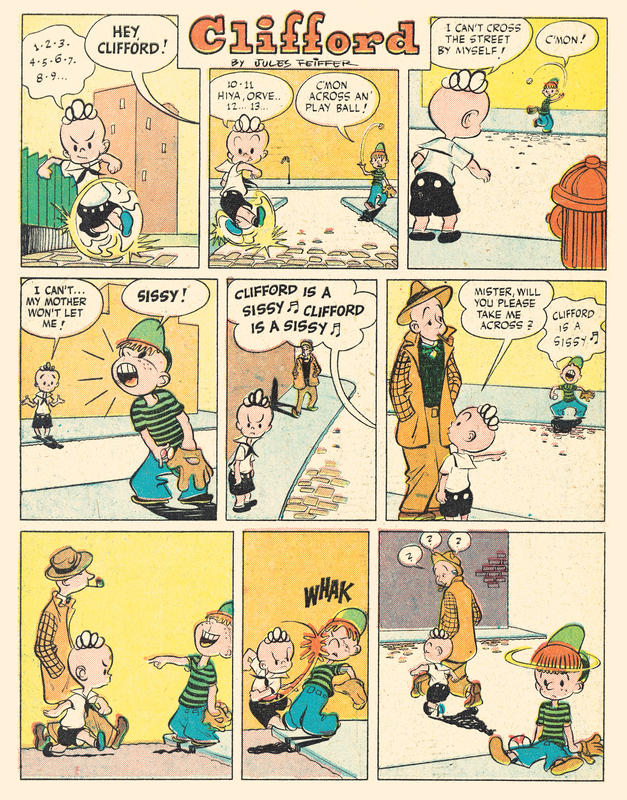 Are we talking Nancy and Sluggo and Little Lulu, too? Uncle Art and Aunt Françoise. I’m going to think of them that way from now on, I think. And we’re totally getting this. Jason’s been putting collections of older comics in our collection, and they’re been doing really well–Little Lulu, Popeye, Little Orphan Annie, even Archie. It’s neat to see how kids respond to them. Every single Saturday, after chores, when my mom handed me my allowance (25 cents – yes, it was a long time ago) I hopped on my bike and pedaled up to Jolly 5 & 10 – a five-and-dime store not too far from my house where they sold all the latest comic books. Little Lulu was a favorite, ditto Sugar and Spike. and Nancy & Sluggo. I am getting this book! Oooh – I LOVE this! I wanted to be a cartoonist when I was little, and still love to look back at the old comics, especially from the 40’s and earlier. I’ve never understood why they were under-appreciated, considering that they are undeniably works of ART, not to mention their literary merit and wittiness. Like JES said, this is now on my Christmas wishlist! John, great question. It would be neat to hear a librarian weigh in on that, but I wasn’t even a twinkle in my mama’s eye then. Jama, lots of Little Lulu, but I don’t think there are any Nancy ones in there, though she’s mentioned. Don’t quote me on this; I’ll try to double-check later. Thanks for visiting, you all! Glad other folks find this interesting…It’s fascinating to look through these old tales and, as Adrienne pointed out, to watch contemporary children respond to them. Je n’aime pas specialement commenter. Votre blog m’a interpellée c’est pourquoi j’ose laisser ce message : merci pour cette contribution et cette possibilité de commenter pour vos lecteurs !